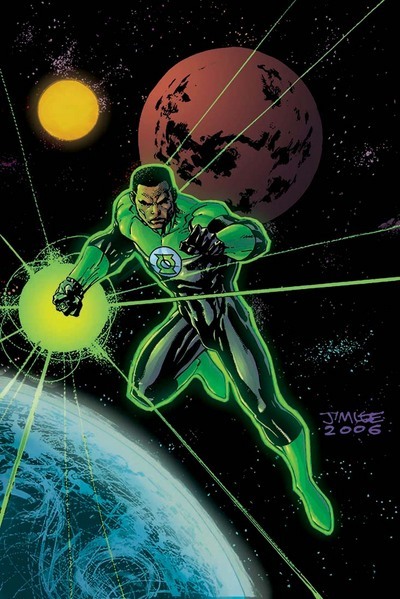 Notes: Green Lantern John Stewart made his debut in 1971 making him the first black superhero for D.C comics and the 3rd Black superhero ever created (First being Black Panther, 1966)! He’s most popular as the Green Lantern on Justice league which once aired on cartoon network. He’s grown from an angry black man to a pillar of the D.C comics superhero community. Powers: Trained by the military in unarmed and armed combat. The Green lantern Ring allows him to create anything he desires or needs for a particular task. John Stewart grew up in the ghettos and found his way into the army where he later became an architect. After leaving the army he took up the life of an architect full time. It was during this time that the Guardians of the galaxy picked him as the replacement for an injured Guy Gardner to “back up” Hal Jordan. They had a tenuous relationship since john had issues with authority figures but in the end Hal accepted him as a worthy green lantern recruit. When ever Hal was busy, incapacitated or away from earth John filled in even working with the justice league on occasion. When Hal took a sabbatical and left the corp he was recruited full time and fell in love and wed Katma Tui and Alien green lantern. His happiness would not last however as Sinestro and Star Sapphire teamed up and he was de-powered and his wife killed. Luckily he was saved by Hal. Soon after he tried to save the planet Xanshi from destruction only for it to literally blow up in his face. This event left John a broken man who desired death more than life, he even contemplated suicide. The destruction of the planet also leads to the creation of the villain Fatality. In this state he helped fend off a mad guardian and emerged the first human guardian and caretaker of the mosaic world, he is also briefly reunited with his dead wife. His new sense of peace is shattered when Hal goes Rogue and destroys the green lantern Corps and the guardians resulting in his wife’s second death. His years of service to the guardians were well received and documented by their cousins the controllers and they recruited him to be one of the leaders of their own team the “Darkstars” which would replace the now non existent Green Lantern corps. He fell in love again this time to Meryan , but again tragedy struck as Grayven son of Darkseid destroyed the Darkstar and left him crippled and on the verge of death. Hal, now Parallax returned to heal his friend before he sacrificed himself to save earth. This “healing” by parallax gave him occasional green concussive energy powers as well though he could not control it. Fatality tried a few times to kill him but she was always stopped by Kyle Rayner of Jenny Hayden. It was in battle with Fatality that he used up all his green energy and ended up crippled again. When Kyle became Ion he healed John fully but John still could not walk it was then that he had to confront his most hidden and darkest secret one he had blocked out of his mind since he was a child. As a teen he took a joyride and as a result he had killed his sister Rose. All the tragedy of his life had now literally bound him to a wheel chair through guilt. Having finally faced up to it he was able to walk again. He was then offered a green Lantern Ring by Kyle when he left for space and John became green lantern of earth once more. After Hal Jordan’s re-birth he was assigned Hal’s backup on earth. During the Sinestro Corp war he was one of the lanterns least affected as he assisted a parallax infested Hal and Kyle to free themselves. In blackest night he confronted the planet Xanshi once more and a newly star sapphire version of Fatality. In brightest day he is assigned to partner with Kyle and Ganthet. During the War of the Green Lanterns John wields the purple lantern ring staff which he uses to kill a crazed Mogo before helping the earth based lanterns stop Krona. 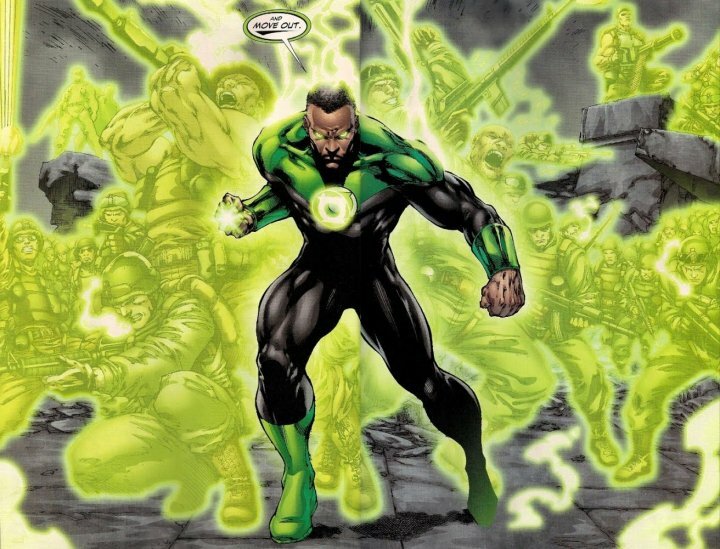 Now labelled the Planet destroyer he continued to soldier on for the corps even after Hal Jordan’s expulsion and himself being tried and convicted of murder after killing a fellow corps member to ensure the safety of the Corps. John Stewart, The Planet Killer! Lots of great info but someone needs to proof-read your stuff before posting. Serious grammar mistakes abound. Not trying to hate. Instead, just letting you know that its a little confusing to read. Also, when you give a stat such as “Green Lantern John Stewart made his debut in 1971 making him the first black superhero for D.C comics and the 3rd Black superhero ever created!”. It be nice if you had elaborated as to who was 1st and 2nd as well as a cover pic of his 1st appearance. Other than that, as I stated before, lots of good information in this article. I read the post and don’t see any grammatical errors and was able to follow easily. If someone is going to make this kind of observation it would be more tactful to email the author, giving him/her the opportunity to make corrections. Haha talk about the pot and the kettle! Your comment is laced with grammatical errors, and doesn’t have any good information. Also, this entry isn’t about the 1st or 2nd black superhero ever invented, its about the 3rd, so if you need to know who those were you can do the research yourself. sounds to me like john and friends have their hands full. woever these “ring slayers” are … the coprs might just be facing a foe who is truly relentless. The rumors of ‘The Rock’ portraying John Stewart are particularly bothersome. Not to put too fine a point on it, but when has the Rock ever been Black? The problem is the problem that has always been. The Rock is as ‘Black’ of a person as they generally want as a hero. Imagine if the villain in this new Superman/Batman film was Black (as early rumor suggested). Nearly every Hollywood ‘Black’ actor was named as a possible. But when the notion of a Black hero entered the picture we found ourselves shuttled back to something from a Micheaux casting. Aren’t we past that?